BERLIN — Bayern Munich's first win in four Bundesliga matches has done little to ease the turmoil at the club. 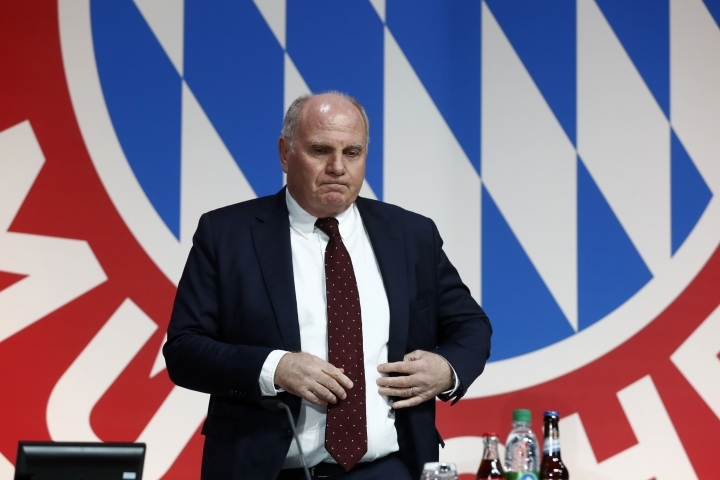 Bayern president Uli Hoeness, who is bearing the brunt of the fan anger, faced criticism, boos and whistles at a stormy AGM on Friday. Members expressed their disapproval of his feud with former friend Paul Breitner, the club's sponsorship deals with Qatar, its criticism of the media and Hoeness' personal tirades against former players and coaches. Hoeness - who was faced with a North Korean flag with the words "Not my president" at the AGM - hit back on Sunday. "I've never experienced anything like this. I hope that it changes again, otherwise it's no longer my FC Bayern," Hoeness said. "This is something I won't accept. This evening will not pass without leaving its mark." The 66-year-old Hoeness doubled down on his criticism of Breitner, who in recent weeks was told he is no longer welcome at the club. "He is now being made into a martyr. Paul Breitner is not a victim but a culprit," said Hoeness, who said the former Bayern midfielder had received "almost 2 million euros" in commission from the club before their agreement was ended. Breitner had criticized the club on Bavarian TV after it hit out at the media in mid-October for negative coverage following a string of poor results, and he had suggested people should be "ashamed" of Hoeness. Breitner received support for his words. "Paul Breitner said what many were thinking and you have to accept that according to basic law of freedom of opinion," one unidentified Bayern fan said to applause at the AGM. But for the president, Breitner's words "damaged FC Bayern." "That's why we told him not to come to the VIP area anymore," Hoeness said. "If he has a problem with us he should say it to us himself, not through the press. That's why we're so annoyed." Besides criticizing Breitner again, Hoeness also suggested veteran wingers Franck Ribery and Arjen Robben will be leaving at the end of the season, and he promised intensive transfer activity to refresh a squad struggling this season under coach Niko Kovac. Bayern is already nine points behind Borussia Dortmund after 13 matches and hopes of a record-extending seventh straight title are fading. "We took in money rather than spending it this season. There are reasons for that, because Franck and Arjen's contracts are running out," Hoeness said. "We will be very, very, very offensive in the transfer market. The tills are well-filled." The Bayern president, who also co-owns a sausage factory in Nuremberg, is facing his toughest days at the club since his triumphant return in November 2016 after serving half of his 42-month prison sentence for tax evasion. Hoeness had given up the role following his conviction in March 2014. Hoeness, a former forward who starred for Bayern and West Germany before he retired at the age of 27 with chronic knee problems, helped the club become a financial behemoth after making the move to management in 1979. Bayern announced Friday another season of record turnover for 2017-18 as revenue reached 657.4 million euros ($744.3 million), an anomaly in debt-ridden European soccer. For the first time on Sunday, Hoeness mulled taking a step away from his club. "I will take the next weeks and months to calmly see how things develop," Hoeness said. "I will consider carefully what I want and what I don't."